Ian Hunter played the Kent Stage on Oct. 5, and we’re here to tell you a bit about that exceptionally good Saturday gig. Leave it to Hunter and the Rant band to rekindle our fire, reminding us that summer is long over and it’s time to start carrying the news again. Going forward we plan to be more diligent about updating the WAG site and we can’t think of a better place to begin than with a thumbs up for Mr. Ian Hunter. Cleveland’s Beachland Ballroom has hosted the past few gigs but this time around Hunter and his Rant band brought the magic to the Kent Stage. This small, seated venue definitely offered the fans (most of them older) a chance to kick back and enjoy the performance but loyal Hunter fans are hard to tame. Hunter barely nudged the audience and they were quick to break, jumping up from their velvet cushioned seats and rushing the stage to show their unwavering support. Opening with ‘What For’ from the 2012 ‘When I’m President’ album was a brilliant idea and totally amped things up from the get-go. The band was tight and the subtle nuances that seemed buried in the songs before; sounded matured, shining brighter and bolder from the stage than this time a year ago. There were so many highlights but if pinned against the wall to rant about favorites; ‘Who Do You Love,’ ‘Ta Shunka Witco (Crazy Horse),’ ‘Fatally Flawed,’ ‘Now is The Time,’ ‘All American Alien Boy’ and ‘23A Swan Hill’ really stand out. The crème de la crème was hearing the complete version of ‘Life’ which like Mott The Hoople‘s ‘Saturday Gigs’ is a true nod to the fans. ‘Black Tears’ and ‘Just The Way You Look Tonight’ were also terrific and naturally ‘When I’m President’ immediately had everyone fired up. As you can imagine, a raucous version of ‘Cleveland Rocks,’ received a warm welcome and when Hunter name-checked Alan Freed and Steve Popovich the crowd went clear over the moon. “Feels like Cleveland!” Hunter shouted out to an overjoyed Kent audience and briefly it felt like we were in some sort of musical time warp, to the point where it didn’t seem to really matter where we were. 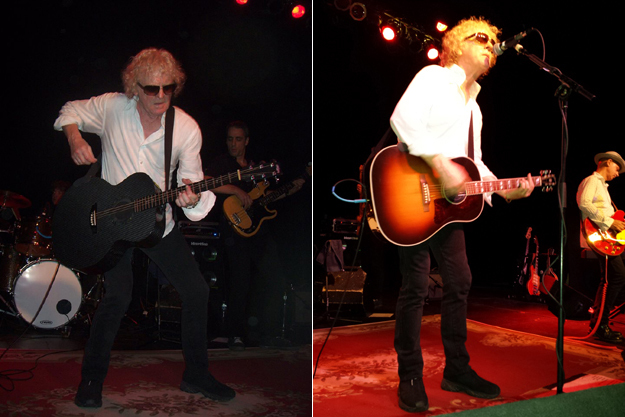 Now, then and always; if Ian Hunter is on the stage, with those glasses, that guitar and that harmonica, it feels like home.